"The cornerstone of the present Chapel was laid by Bishop Bayley on May 21st, 1863. The sermon of the day was preached by Father McQuaid; and Bishop, afterward Cardinal, McCloskey, honored the occasion by his presence." Joseph M. Flynn, ed. The Catholic Church in New Jersey, Morristown, New Jersey, 1904, 604. "The Chapel, which is built of stone, was designed by Mr. J. O'Rourke, architect, built by O'Rourke & Moran, and decorated by J. R. Lamb of New York. A new altar was presented by Mrs. Eugene Kelly of New York." 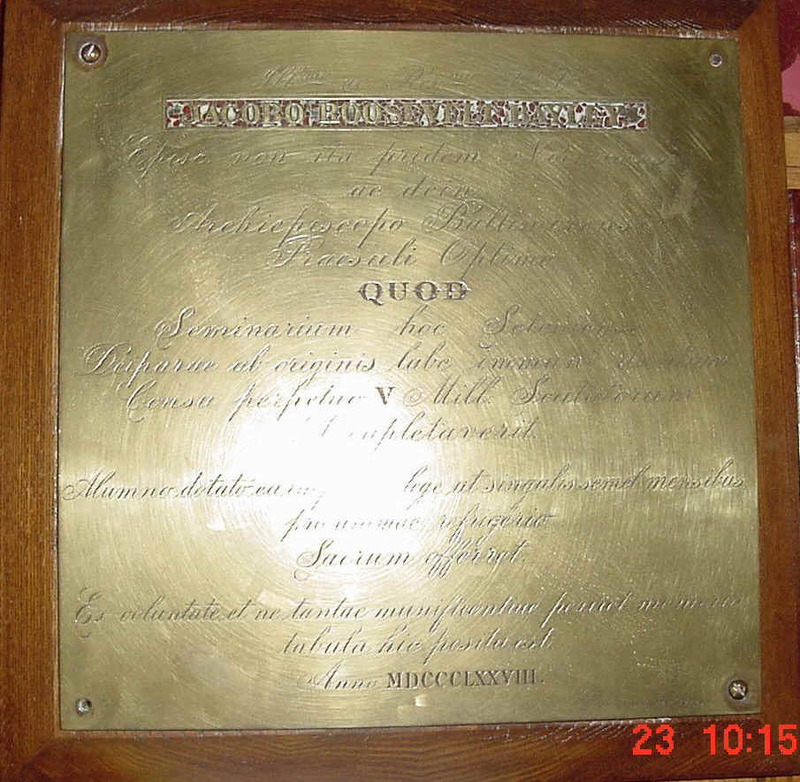 This item, appended to a small notice describing the dedication of the Chapel in 1870, is the only clear information we have concerning the decoration of its interior immediately after its completion. While there are photographs and engravings of the exterior from the 1860's, the first photograph of the interior dates from 30 years after the completion of the Chapel. It is possible that the interior was painted by E. Ertle, "Artist in Oil and Fresco." Correspondence between Ertle and Father Corrigan, President of Seton Hall, refers to Ertle examining the rear wall of the Chapel for damage and a subsequent payment to Ertle of $100. Censu Perpetuo V Mill. Scutatorum Locupletaverit. the sum of five thousand dollars as a perpetual bursary. for the repose of his soul. this plaque has been placed here. In the year of Our Lord, 1878. Just as there are no drawings or photographs of the interior from the early years, there are no written descriptions. 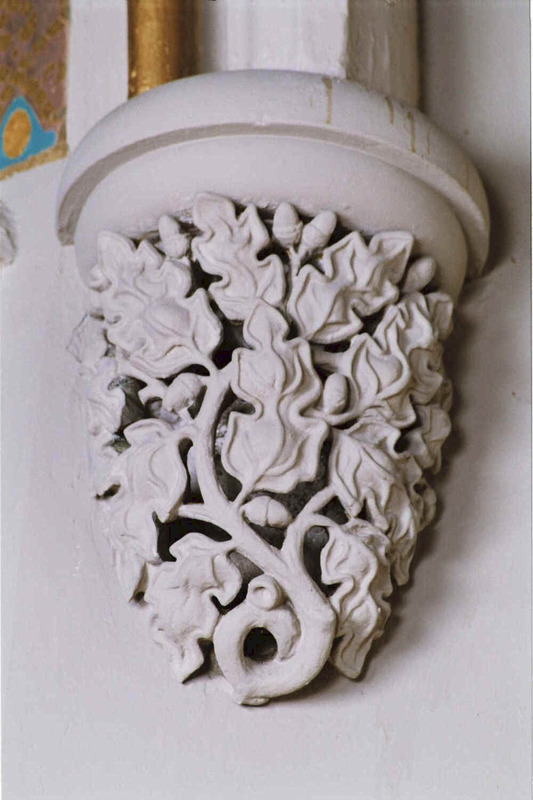 However, the quality of the original decoration can be seen in the details of one of the corbels "supporting" the chancel arch. It is a rich sculpture of oak leaves and acorns, perhaps reminiscent of the oak trees that still grace the campus. We can be certain that the Chapel was filled with beautiful music from its earliest days. In August 1865 an organ made by Henry Erben was installed. Erben, the foremost manufacturer of church organs in the nineteenth century provided a pipe organ for the Chapel. We do not know the exact price but, in a letter to Father McQuaid, President of Seton Hall, Erben asks that McQuaid not reveal the price charged since "it cannot be made for less than $3,000." The cost of shipping was $16.50.